McCaffrey never lasts to 22. Hes going to blow Reggie Bush's combine and pro day results away. I think hes will draw some Edgerrin James comparisons, similar player, not as physical but a little more quicker and explosive and thats say something cause Edge was redic. But McCaffreys a absolute freak of nature. What? McCaffrey is more like Bush. How is he like Edge? Edge was so tough to bring down. Just a really powerful runner. He isn't like him at all. I also highly doubt he tests better than Edge (or Bush). You can call me out if I'm wrong, but I definitely don't think I will be. Not that having worse testing numbers than them means he won't be a great player. I love McCaffrey, but this post is completely off-base. This is an unreal RB class coming up, it'd be silly to take a RB earlier than the mid 2nd unless one of these guys emerge as true blue chippers and fall into our lap. 2018 Draft: Saquon Barkley + Court Sutton #20 #92 Fire Doof Pederson. There very similar size and build. I said hes not as physical but maybe your undderating McCaffreys power and Edge grew more into that power guy with age and injury. While James was physical coming out, he was more a burner and a more elusive runner, specially compared to his peer at the time like Ricky Williams. I doubt McCaffrey tests as good as Edge (who was roided to the gills for that work out lol) but i imagine he comes in in a similar ball park to Edge, 6'0 212ish compared to Edges 6'0 216 low 4.4 speed compared to Edges sub 4.4 40. And McCaffrey is a interesting prospect, Hes got some Reggie Bush to him, i just remember Bush being way more gadgety and way more of a dancer-cut man- a whole kitchen sink of open field moves compared to McCaffrey who just gooooo's bro, like drops into 5th gear and goooo! Its not that crazy of a comparison at all. 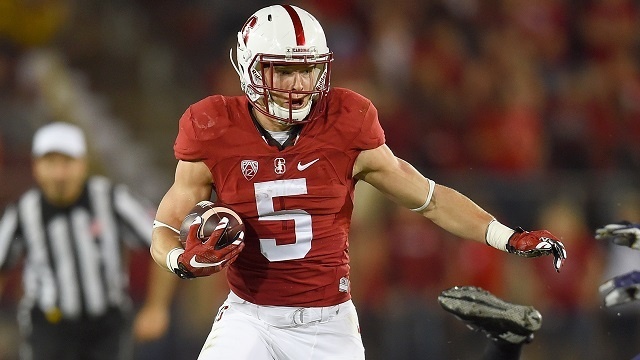 McCaffrey has excellent quickness/burst, agility, and feet, good hands and decent vision. He plays A LOT more like a hybrid "weapon" than a pure RB. His long speed is suspect and DBs toss him around if they get their hands on him. Any team that drafts him expecting him to carry the load at RB will be severely disappointed. He will make his money as a versatile threat - part slot WR, part RB, part return specialist. Edge was my favorite RB in the NFL until Deuce McAllister came along. 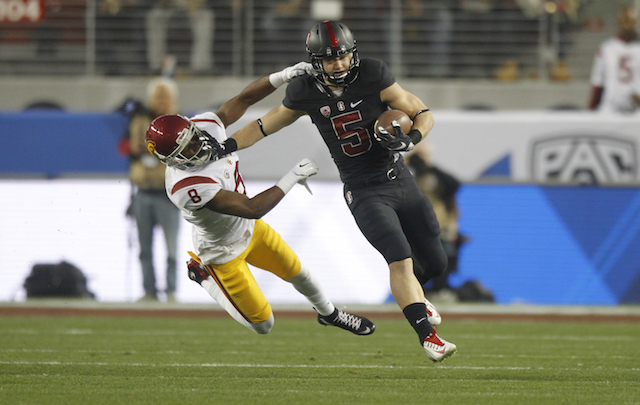 Christian McCaffrey is a different style of runner. I don't know who to compare him to. His running style is a combination of Shady/Bush with some Arian Foster. Probably closer to Shady and Foster as an athlete than Bush or Edge. He looks fast, but I bet he won't time that fast. 4.48 is my guess. Brian Westbrook might be a good comp as far as what he can do running and catching and returning, but his body type is a little different. He has good size calves and arms, but his thighs look like WR thighs and his upper body doesn't look like a V. He basically looks like a WR with big calves. And I can't really think of any NFL RB's that look like that, so it's hard to say if he could handle 20 carries or 25+ combined touches in the NFL. At the very least, he should be another Sproles type weapon, but I dunno if he's a franchise back. I still like him a lot though and think he will help an NFL team out one way or another. I think his top speed is probably slightly faster than Shady's, but not anything special. The same holds true for my boy Desmond King, but if you have fantastic stop-start ability to go with at least 4.5 speed, good instincts can take you far in the NFL. I dont know about that at all bra. He pops off long run after long run, and blows by every one except for the super deep safety or safeties the opposing teams have to play because of him. And he never gets throw around or goes backwards and blows up DB or runs over them a lot, i dont know who you are watching but McCaffrey isnt easy to take down, more times then not some one is human caping him. You could make the argument DB's at the next level might throw him around, but not college. And maybe he will be one of those guys that never runs away from any one at the next level, not a lot of those guys around in the NFL really tho, cause every one is fast in the NFL. 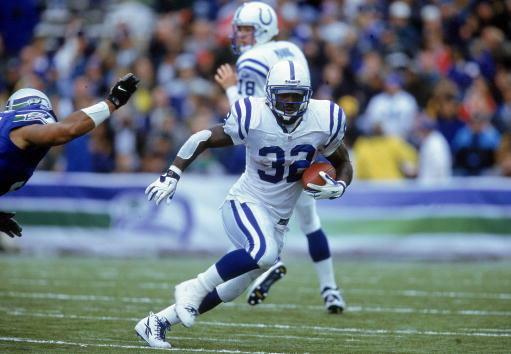 Edggerin James was a multi tooled weapon with he Colts. and he wasnt the grinder rugged power back he later became, he was way more finesse skilled. And people have this imagine of Eddgerin that they saw during his pro day where he was aboslutely rock hard cut.... HE NEVER LOOKED LIKE THAT AGAIN... He had a moment where he bulked up in Arizona, but he was never ever in the shape he was when he was trying to get drafted lol. Here he is in like 2000 going to training camp for the Colts. Looks like your average guy at 24 hour fitness lol. He wasnt overly big. He grew into that guy later. Another guy who went through this was Clinton Portis, was just a burner when he when he first came into the league and he slowly became a battery ram. I wonder how tall McCaffrey will measure out. Might be one of those shorter then listed guys. Seen him get absolutely rag dolled by too many lesser DBs to think much of his power game. He is able to break his big runs much more due to his good feet, agiliy, burst, and vision. He likely runs low 4.5s to high 4.4s. Not slow, but definitely quicker than fast. His cone/shuttle times should be good. The kid is good. He can be a 3 down player, just not necessarily a 3 down RB. Seen him get absolutely rag dolled by too many lesser DBs to think much of his power game. He is able to break his big runs much more due to his good feet, agiliy, burst, and vision. He likely runs low 4.5s to high 4.4s. Not slow, but definitely quicker than fast. His cone/shuttle times should be good..
Fair enough, i know you would never make up that, and maybe my judgment of him isnt great cause i watched him run over scrubby DB's from Oregon St and Oregon lol. I agree with this. I dont see him as a true RB , but has a lot of RB skills and reminds in some ways of some multi skilled RB's. I was thinking driving tonight hes got a lot of Julien Edleman to him, whos a special team horse and a can line up all over a formation. Like hes somewhere between Arian Foster and Julien Edleman if that makes any sense. He could flake out like Spiller.